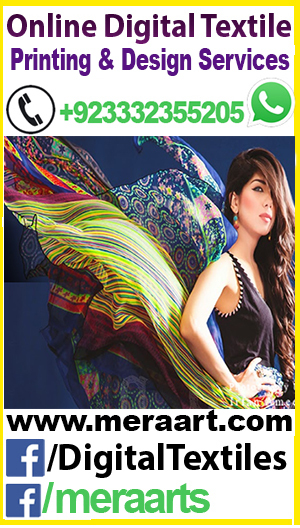 Kindly Send for enquiry for the best price in Pakistan pleas follow the instruction for the Rreactive and sublimation Dyes Inks of digital textiels printers. 4 cont persone name name mobile no. There are basically four different types of dyestuffs that are now being commercially made into digital inks. Each ink category is capable of printing a particular type (or types) of fiber. Cotton, linen, silk, rayon, and many other plant-derived fibers including jute and hemp can all be printed with fiber-reactive inks. The colors are very bright, and the lightfastness is appropriate for apparel and home furnishings. Since the dye in the ink actually reacts with the fiber, it actually becomes part of the fiber, resulting in excellent washfastness. Fiber-reactive inks require using fa bric that has been pretreated for digital printing. These fabrics are commercially available today from a wide variety of sources. Once printed, the fabric must be steamed and washed, which is much simpler than many printers realize. This process will be discussed later in the article. Nylon, silk, wool, and leather can all be printed using acid inks. As with fiber-reactive inks, acid inks give very bright colors. However, acid inks have better overall lightfastness than fiber reactives, making them appropriate for outdoor flags. Acid dyes also react with the fibers, giving very good fastness to washing. As with reactive inks, the fabric must be pretreated with materials to facilitate their fixation and again, this pretreated fabric is widely commercially available. Similar to reactives, post-processing of acid inks is accomplished by steaming and washing the fabric (with the exception of leather). Disperse inks in almost all cases are limited to polyester. The colors can be bright, but in general are not quite as bright as those of the acid and reactive inks. Disperse dyes “sublime,” or become a gas when heated to very high temperatures. Once they become gaseous, they are absorbed by the polyester fibers where the dyes condense and become physically trapped inside, thus giving very good resistance to laundering. Disperse inks typically fall into two categories, low energy and high energy. Low-energy disperse (transfer or sublimation) inks. The low-energy, or “dye sublimation,” inks provide good lightfastness and resistance to weather. They can be printed on paper and subsequently transferred onto polyester, or they can be printed directly onto fabric and then “thermosoled” or heated in an oven or transfer press. High-energy disperse inks. These dyes must be directly printed onto polyester. High-energy disperse dyes provide outstanding lightfastness. Their excellent resistance to fading by the sun makes them appropriate for the toughest outdoor applications, including outdoor furniture and even automotive upholstery. They are printed directly onto the fabric that is then oven cured or passed through a transfer press for fixation. They cannot be transferred from paper to polyester. 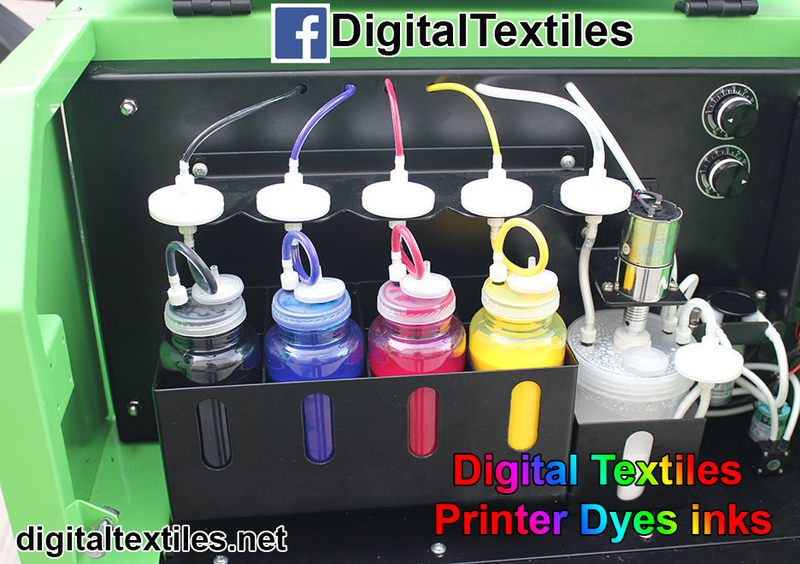 Because of the popularity of “dye sub” printing, polyesters for digital printing are probably the most widely available of digital fabrics. At first glance, pigment inks seem to be the best choice for printing textiles. They tend to have excellent lightfastness and can be used on all fibers. Fixation is very simple, involving only heat or UV curing. However, pigment inks must contain a resin to “glue” the pigments onto the fiber. The addition of this resin limits the amount of pigment that can be included in the ink. Therefore, a pigment ink that contains a high level of color typically has less resin, and thus has lower washfastness. Pigment inks with good washfastness typically have less color in them. Because many of these resins cure when heated (like glue), they cannot be used with thermal (bubble-jet) printers. There are literally thousands of fabrics available for printing, and the number of fabric suppliers is rapidly growing. However, for superior print results, it’s crucial to find a reliable, consistent fabric source that specializes in your desired fabric. It’s also important to select the appropriate fabric for your application. For example, flags, banners, signs, and outdoor materials typically need to be made of woven synthetic fabric such as nylon or polyester for durability. For apparel and home furnishings, anything goes. Gaming table fabrics were traditionally made from wool, but are now also made from nylon and polyester. Since the quality of the pretreatment of the fabric can mean either success or failure of the finished product’s ability to perform its intended task, it’s important to choose a fabric supplier who is technically adept. Acids/alkalis support reactions of acid and reactive inks, respectively. Urea/glycols increase moisture content of the fabric, giving high, even fixation of the inks. “Effects” chemicals vary widely in purpose. Although there are too many to mention here, they can include chemicals to improve the brightness of the prints, UV absorbers to improve the fabric’s resistance to sunlight, fabric softeners/stiffeners, even antimicrobials to provide resistance to mildew and bacteria. The processing of the fabric during pretreatment is also an important factor in producing a superior finished printed fabric. Fabrics must be crease-free and even in width. Some producers provide fabrics that are backed with removable paper to allow companies with graphics printers that have been retrofitted with textile inks to print fabrics. This paper, and the adhesive that holds it to the fabric, must be properly applied so that the paper can be removed easily from the fabric. Pigments are the simplest to process and involve only curing in an oven. Typically, ink manufacturers recommend a cure at 325-350 F for 30-90 seconds. Some print shops use their transfer presses to accomplish this task. For disperse-transfer or dye sublimation, paper is printed and subsequently transferred in a press to polyester at 380-410 F for 30-90 seconds. For high energy disperse prints, the fabric is cured or “thermosoled” at 380-410 F and, depending on the fabric, can be washed and dried to remove excess unfixed dye if necessary. Reactive-printed fabrics are steamed in order to fix the dyes. In non-pressurized or “atmospheric” steamers where the material is not rolled up, the fabric is steamed for 8-10 minutes at 212-214 F. The time required for reactive dye fixation in pressurized steamers varies from manufacturer to manufacturer, but is typically in the 20- to 30-minute range. Once reactive dyes have been steamed, the fabric must be washed. Because of the amount of unfixed color that is removed in the washing process, it’s generally recommended that reactive prints be washed in two or more cycles, starting with a cold rinse and followed by progressively hotter washes. By doing the washing in steps, a limited amount of unfixed color is removed in each cycle, thus reducing the chance of “backstaining” the fabric with loose dye. In some washing units, there are multiple washing troughs, allowing multiple cycles to be performed in one pass through the unit. Drying the fabric can be performed with many types of machinery, from dedicated textile drying units to transfer presses. Many print shops use residential tumble dryers. As with reactive dyes, acid dyes are steamed in the fixation step. The temperatures are the same but the times are roughly doubled, to about 20 minutes in atmospheric steamers (40 minutes for heavy materials and green/turquoise shades) and about 40–60 minutes in pressurized steamers. The washing procedure for acid dye-printed fabrics is essentially identical to reactive-printed fabrics, starting with cold rinsing followed by successively hotter washes. There has been and will be much speculation as to where new applications of digital printing will be found in the future. The potential for digital fabric printing is growing exponentially, with entrepreneurs finding new ways to exploit this rapid growth. With its low cost, fast turnaround, and unlimited flexibility, digital printing has begun to take over and expand large portions of the printing market. With advancements in software, hardware, and chemical technology being made every day, the old way of printing may be going the way of the dinosaur. David Clark is a technical representative for inkjet textiles at Huntsman Textile Effects in High Point, N.C. This entry was tagged 3d digital textiles fabric printing machine, digital 3d epson printer, Digital HP prnteir, digital Rreactive Dye Ink in pakistan, digital Rreactive Dye Ink karachi, digital Rreactive Dye Ink lahore, digital sublimation Dye Ink in pakistan, digital sublimation Dye Ink karachi, digital sublimation Dye Ink lahore, digital textile printer machine, dyes inks for digital chine textiles printers, dyes inks for digital italy textiles printers, gital 3d Rreactive Dye Inks rawal pindi, gital 3d sublimation Dye Inks rawal pindi, Rreactive Dye Ink, Rreactive Dye Ink digital 3d fabric printers, Rreactive Dye Ink digital fabric printing, Rreactive Dye Ink digital textile printer, Rreactive Dyes Inks digital textiles, Rreactive Dyes Inks for digital fashion fabric, sublimation Dye Ink, sublimation Dye Ink digital 3d fabric printers, sublimation Dye Ink digital fabric printing, sublimation Dye Ink digital textile printer, sublimation Dyes Inks digital textiles, sublimation Dyes Inks for digital fashion fabric. Bookmark the permalink.